British curling has been an exclusively Scottish endeavour at the elite level, but attempts are being made to identify the best UK athletes with the proficiency and desire to compete for a place on the GB Paralympic Curling Squad. A series of events, all at Scottish venues, have been arranged where weight control and accuracy will be assessed. The organisers warn: this complex system is aimed at elite level athletes and is not for beginners as a “come and try event”. Applications (deadline October 1st) are available for download HERE and information packs can be obtained from Amber Thomson. More details on the program and eligibility can be seen HERE. I found the link on Bob Cowan's Skip Cottage Curling blog, in a post detailing his visit to Sterling's recreational wheelchair curling program. Details and photos HERE. As you will see by the enclosed cheque for $100, we have responded to the challenge from Team Bradford for teams to match their contribution. 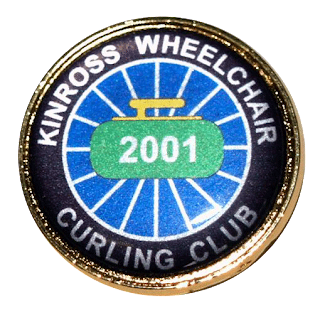 We find wheelchaircurling.com to be a very informative site and consider it to be the place to go for information about wheelchair curling. We also know that it does take a considerable amount of your time, energy and money to maintain the site to the high standard that you have set. 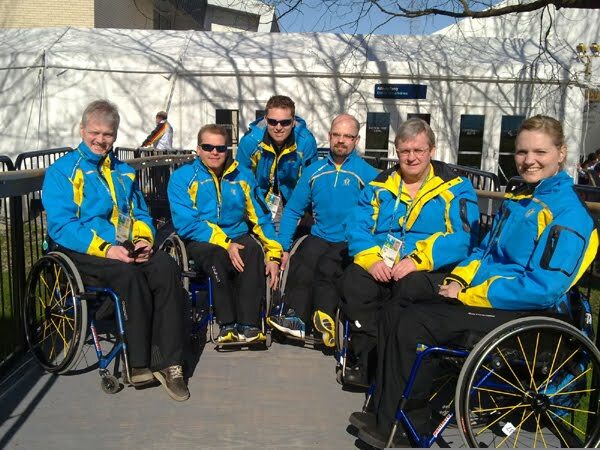 At times I am sure that the thought crosses your mind that no one cares about your efforts and wheelchaircurling.com. Please be assured that we do care and rely on the information that you provide to the wheelchair curling community not only in Canada but throughout the world. We thank you very much for your time and effort. 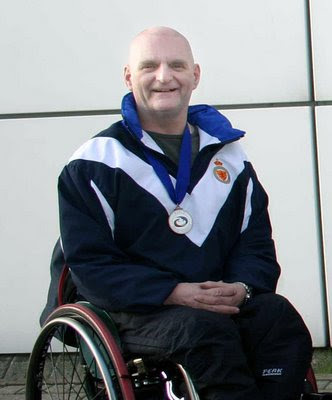 We will also challenge all wheelchair curling leams world wide to at least match, if not better the contributions from Team Bradford and Team Cameron so we will be able tocontinue to enjoy wheelchaircurling.com. Closing date for applications to compete in the 3rd Annual Wetzikon Invitational in Zurich, Switzerland, is October 2nd. There will be a maximum of 12 teams, playing in two pools, four games guaranteed. Entries are CHF280 (approx. $300 Canadian) and includes the Saturday banquet. Full event details are available (in German and English) HERE. With the season already under-way in Ottawa, here are some things to consider when practising. Most clubs will have members who are qualified coaches, and who can be asked to help form a practice plan, if not to oversee every practice session. Every wheelchair user with access to curling ice, should also have, if they ask, access to coaching expertise at the club. Much of what makes for good practice with regular curlers, is also good practice for wheelchair curling, so don't allow unfamiliarity with wheelchairs to be a bar to receiving coaching help. The CCA also has a brochure that includes basic information including drills for those new to wheelchair curling. Ask at your club or contact the CCA's Danny Lamoureux to receive a copy. The three elements to delivering the stone, speed, direction and rotation, are the same for everyone, and rely on consistency. This is why it is important to practice the way you will play. Bad practice is worse than no practice. For example; if you need your chair braced to prevent it moving when you throw, it is useless and probably detrimental to throw on your own. You will find yourself adjusting for the lack of a bracer, and the muscle memory benefits of practice won't be relevant when you compete. A draw without sweepers will always be a lower percentage shot than a draw with sweepers. Many wheelchair curlers compensate by relying on up-weight throws; hits rather than draws, minimizing the importance of distance and the effect of the curl. There are all sorts of hitting drills, but you might try this "line drill" when you do not have someone to hold the broom. Place two stones 20 feet away and move them 2 feet apart. Now throw as hard as you can between them. This has the benefit of concentrating not on where the stone finishes, which is the responsibility of the broom holder, but on where the stone needs to be when it starts. It is difficult for throwers to know without being told, whether an up weight shot started on line. If you can't reliably throw through a 2 foot gap, widen it. Then reduce it as you succeed. Stones are just under a foot in diameter, so set a "gap target" to pass through before the stone starts to curl, and move it across the ice so you throw from different angles. Finally, club ice-makers try to keep their ice consistent so their members know what to expect. That can mean that depending on the venue, a T-line draw may take anywhere between 11 and 14 seconds to travel the same distance. The weight you need for a given shot can vary significantly. This is not an issue if you always and only play on the same surface. You learn how much weight a particular shot needs, and should, with practice, be able to make small adjustments for changing ice conditions during a game. Sweeping makes adjustments easier, but what do you do to learn to "put a bit on" or "take a bit off" to adjust to the very different ice you might meet in competition. Try reducing or lengthening the distance that you throw when you practice. To simulate fast ice, move closer to the house, over the hogline. To simulate heavy ice, move further back. Team Canada skip Daw, 40, who won three national wheelchair curling titles, silver and bronze at the Worlds and a gold medal at the Turin Paralympics, has been inducted into the London, Ontario, Hall Of Fame. He attended the Western Fair ceremony with his wife Morgan and their infant daughter Arouyn. “This is the culmination of everything,” he told Steve Green of the London Free Press. “The day it was announced that I was being inducted, I called my mom (Eleanor). The very next day, she passed away. The London Hall Of Fame video citation can be viewed at this link or seen below. 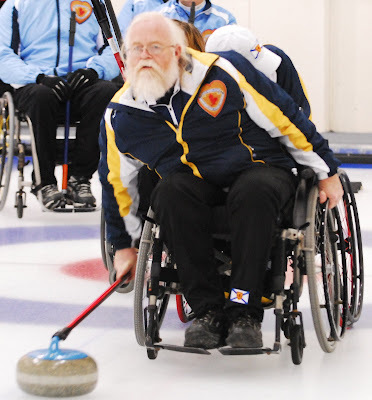 Bruce Cameron writes to say that wheelchair curling will be starting at the RA Curling Club in Ottawa this Saturday, September 25th, 3 - 5 pm. All wheelchair users are welcome. No previous experience necessary. Yearly memberships are $10, but no one will be turned away for lack of funds. Ontario Champions Team Cameron will be on hand for a meet-and-greet on Saturday 2nd Oct 2010, and will give a demonstration before being presented the Team Ontario provincial banner they won at last season's Dominion Provincial Championship. Twelve athletes will be attending the Team USA tryouts this weekend in Green Bay WI, including all five members of the team that finished fourth at the 2009 Worlds and the 2010 Vancouver Paralympics. Making the Team - The 2011 U.S. Wheelchair Curling Team Selection will take place Friday through Sunday at the Green Bay (Wis.) Curling Club. 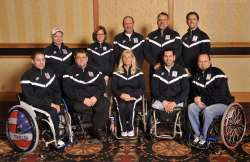 The individual skills tryouts will help select the national team for the season to compete in various international and national competitions as well as wear Team USA at the 2011 Wheelchair World Championship in March in the Czech Republic. Twelve athletes are competing to be named to the roster, including all five members of Team USA's wheelchair curling team from the 2010 Paralympic Winter Games. [from the CCA profile] Michael Fitzgerald has built himself quite a resume, both on and off the ice. On the ice, he’s been a dominant force in Nova Scotia wheelchair curling; he’s claimed the last three provincial titles and has represented the Bluenose Province at the last three national championships, in 2008 at Winnipeg (3-4 record), 2009 at Halifax (3-6 record) and 2010 in Kelowna, B.C. (4-5 record, just out of the playoffs). 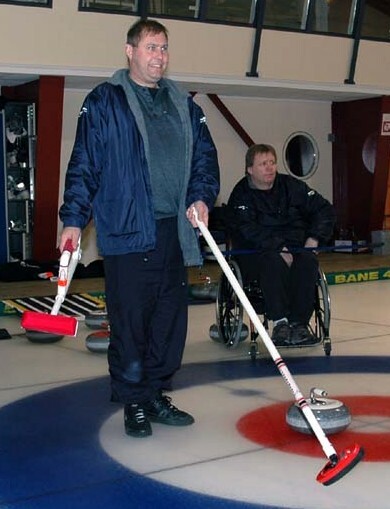 As well, Fitzgerald has worked behind the scenes to help wheelchair curling; he’s a Level 1 coach specializing in the wheelchair discipline, and has instructed many new wheelchair curlers in Atlantic Canada. Add to that his upcoming duties, volunteering at the 2011 Canada Winter Games (he’ll be an accessibility representative at the Mayflower Curling Club, which will host the curling competition) and you get the picture about Fitzgerald’s commitment to the Roaring Game. 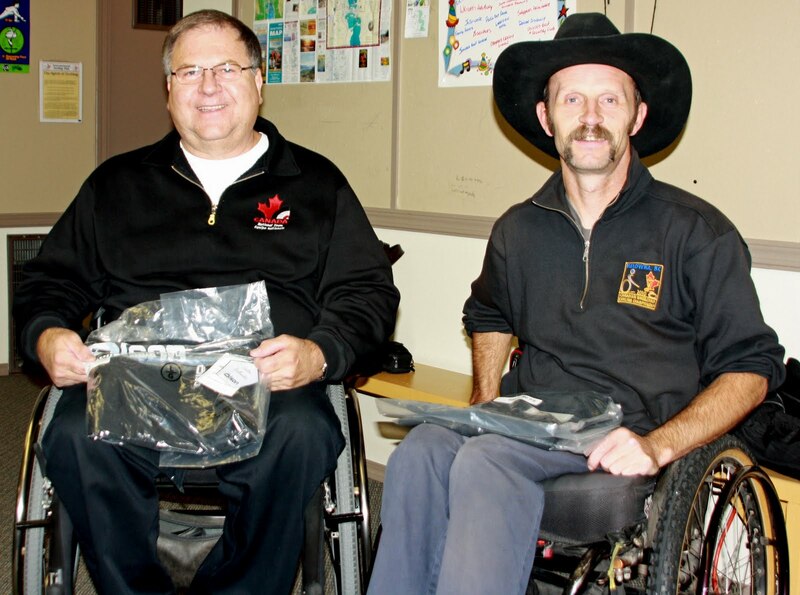 Wheelchair users in Lethbridge AB will have the opportunity to curl this season in a program promoted by the Alberta Health Service as part of its theraputic recreation initiative to keep wheelchair users active during the winter. Canadians are invited to experience first-hand various Paralympic sports during hands-on sport demonstrations in Ottawa (ON) and Richmond (BC) on the first-ever Sports Day in Canada, September 18. Paralympians Chris Daw and Darryl Neighbour will be among those attending the Richmond Oval in BC from 11 - 2, and there will also be an Ottawa event at Lansdowne Park, Ottawa. Read the Canadian Paralympic Committee's media release HERE. The 4th Annual Danske Internationale Kørestole Curling Cup 2010 was held this past weekend at the Taarnby Curling Club. Teams from host Denmark, Finland, Czech Republic, Germany, Russia and two teams from Norway competed. 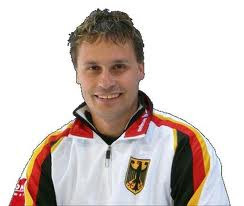 German Paralympic team skip Jens Jager is no longer part of the German national team, but brought a new team, the "Mainhattan Ice-Wheelers" made up of players from Frankfurt and Schwenningen. Norway split their Paralympic squad with Rune Lorentsen and Geir Arne Skogstad skipping. Rune's Norway 1 went unbeaten to win the tournament, with Denmark 2nd and Finland 3rd. Full results and line scores are HERE. Per Christensen, a Dane who took over from Thoralf Hognestad as coach of Norway for the Paralympics before handing the team back to Thoralf after Vancouver, is back as coach of the Danish national side. "After a long down period for the Danish team, it seems that they are on their way up," Per told me. Denmark had failed to qualify for the Worlds in 2008 and 2009. "I think that it has been an advantage for them to have the break," he added. "We used the tournament as practice for the World Champoinship Qualification Tournament in Lohja Finland, November 6-12." The Kinross Wheelchair Curling Club, formed in 2001, is holding a "come and try" session at 12.15pm on Saturday September 25 at The Green Hotel, Kinross (SCO). No experience necessary. The club has 15 curlers competing in league play, and a full schedule of events. Their fundraising Ceilidh at the Windlstrae Hotel brought in 100 people and raised almost a thousand pounds. More information about the club can be found at their website. Gary Cormack and Vince Miele, continuing the form that saw them win a national title last March, won the 4th Annual Olsen Curling Supplies Osoyoos 2 on 2. They beat fellow teammate Rich Green and Team Canada member Bruno Yizek 7-4 in the final of the two day event to win cash, and a curling jacket and pants. 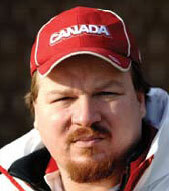 Team Canada members Darryl Neighbour and Sonja Gaudet finished 3rd in the five team field. 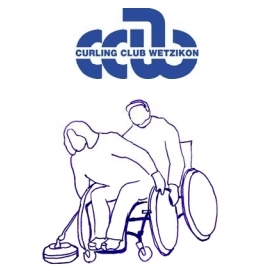 The Royal Caledonian CC, the national governing body for British curling, is offering a 3-4 hour course for current RCCC qualified coaches, intended to introduce them to the sport and enable them to instruct a beginner who uses a wheelchair. The course will cover delivery styles, safety awareness and include the coach using a wheelchair during the course and thus "gaining valuable insights into the perspective of a wheelchair user." Sometimes no news is good news, and sometimes no news means that everyone is holding their breath and hoping not to be crushed when the elephant sits down. With skip Jim Armstrong awaiting trial, presently scheduled for October 25 in US District Court in Seattle, for trafficking counterfeit pills, there has been no Team Canada activity over the summer. After a four year campaign ending in gold medals at the 2009 Worlds and 2010 Paralympics, there was always going to be a slower pace to this season as plans are made for the next quadrennial, with a switch of emphasis from international competition, to encouraging domestic competition. 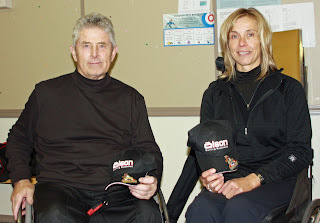 While Joe Rea remains national team coach, Wendy Morgan has been appointed National Program Manager for wheelchair curling. 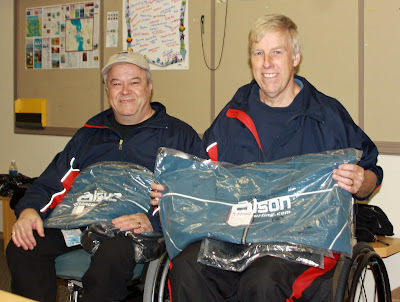 This will entail working with each province's designated wheelchair curling coordinators. I am assured that each province has such a person and I will publish their names as soon as I have them. The CCA's involvement in wheelchair curling will continue to be split between the Discover Curling Program run by Danny Lamoureux and responsible for grassroots development, and "long term athlete development" which will be assisted by the national coaching staff and national program athletes. While there is an argument that this separation is artificial and obstructive of grassroots development, it fits the existing determination of CCA staff to keep national team membership and training under their close control. It is likely that a group core of athletes from the current National Team will represent Canada at the World championships in Prague in 2011." There will, however, be a nation-wide series of "Talent ID/Development Camps with the intention to recruit talented/promising wheelchair athletes to the National Team Program while making a positive contribution to local wheelchair curling programs." What that means for ambitious curlers outside of the present program, is that either by winning your provincial championship, or by gaining the sponsorship of your provincial coordinator, you will have the opportunity to at least make yourself known to national coaching staff. A provisional list of potential venues includes St. John's NFLD, Halifax, Ottawa, Thunder Bay, Winnipeg/Regina, Calgary, Richmond and Whitehorse. The 4th Annual Olsen Curling Supplies 2 on 2 Bonspiel will begin at 9 am Saturday, September 11 at the Osoyoos CC just north of the BC/Washington State border. Team Canada members Sonja Gaudet, Darrryl Neighbour and Bruno Yizek will be playing, with Team BC members Gerry Austgarden, Frank LaBounty and Alison Duffy, national champion skip Gary Cormack with his team members Rich Green and Vince Miele. There's an odd number of teams registered, so a last minute arrival would not be unwelcome. Give Gerry a call at 250-979-3030 (work) or 250 768-0751 (home).